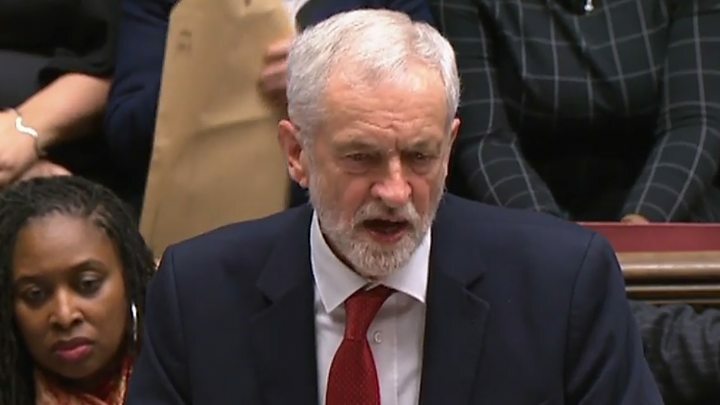 MPs are set to debate the confidence motion for about six hours following Prime Minister’s Questions at 12:00 GMT, with Labour leader Jeremy Corbyn saying it would allow them to give their verdict on “the sheer incompetence of this government”. BBC political correspondent Iain Watson says that if the prime minister sees off the challenge, she will begin a series of meetings with “senior Parliamentarians” on Thursday. He said Mrs May intended to retain her “red lines” – ruling out Labour’s demand for a customs union with the EU – with sources suggesting compromising on this would risk cabinet resignations. But first the prime minister must survive the confidence vote tabled by Mr Corbyn and backed by MPs from the SNP, Lib Dems, Plaid Cymru and Green Party. Shadow chancellor John McDonnell told the BBC that they were expected to lose the vote. “But who can tell anymore because after yesterday’s vote anything can happen in Parliament,” he said. But he said Jeremy Corbyn had not been contacted for discussions with Mrs May. Despite the government’s heavy loss in the Brexit vote, Conservative rebels are likely to come back on-side in the confidence vote. Leading Brexiteer Boris Johnson said the huge defeat gave the PM a “massive mandate to go back to Brussels” to negotiate a better deal. And DUP Westminster leader Nigel Dodds told the BBC his party would be backing the government in the confidence vote. “I think that this government still has the opportunity to deliver on the referendum result,” he said. He said the backstop “was clearly the problem” and if that “can be sorted out” then his party and others against Mrs May’s deal “can be brought back on board”. How does a no confidence motion work? By the BBC’s head of politics research. How has the EU reacted? The UK remains on course to leave the EU on 29 March but the defeat throws the manner of that departure – and the timing of it – into further doubt. European leaders reacted to Tuesday’s vote with dismay but gave no indication they were willing to make concessions. Several have warned of increased chances of a no-deal Brexit, which many MPs fear will cause chaos at ports and damage industry. Michel Barnier, the EU’s chief Brexit negotiator, said Brussels “profoundly regrets” how the UK’s MPs voted, after two years of negotiation “based on the red lines of the British government”. “It is up to the British authorities today or tomorrow to assess the outcome of this vote and up to the British Government to indicate how we are going to take things forward on 29 March to an orderly withdrawal,” he said. And European Council President Donald Tusk has appeared to suggest that the UK should stay in the EU. 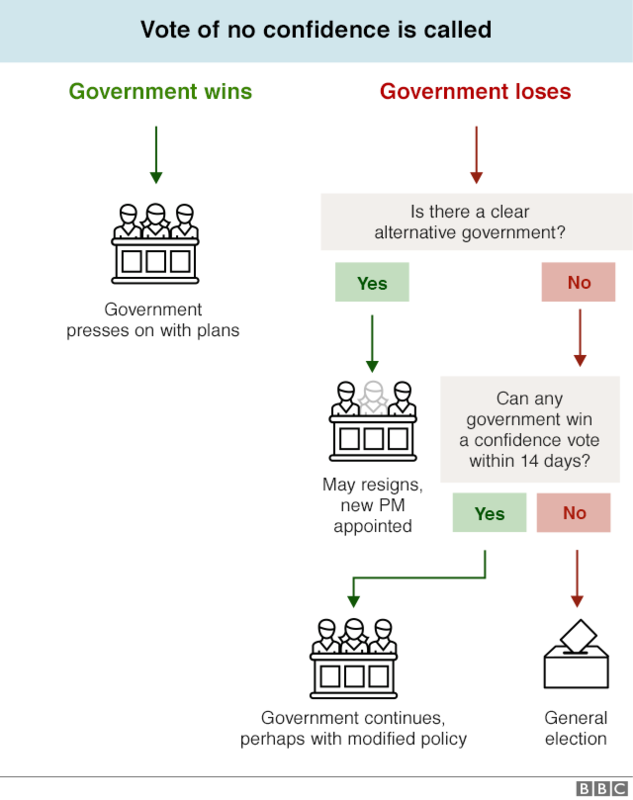 Why did MPs reject Theresa May’s deal? The Commons defeat – the largest in history, by 432 votes to 202 – came as a huge blow for Mrs May. She had spent two years negotiating the plan aimed at bringing about an orderly Brexit and setting up a 21-month transition period to negotiate a free-trade deal with Brussels. But it faced opposition across Parliament, from MPs who want either a further referendum, a closer relationship with Europe, to stop Brexit altogether or the UK to leave without a deal. A key sticking point remains the Northern Irish backstop – the fallback plan to avoid any return to physical border checks between the country and Ireland. Many MPs argue could it keep the UK tied to EU customs rules indefinitely. Did my MP vote For or Against the Brexit deal? 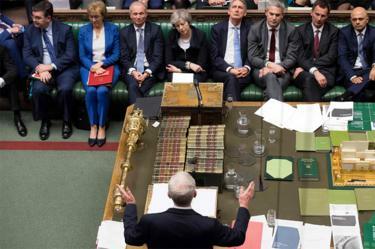 In the run up to the vote, the prime minister had tried to reassure MPs from all sides of the House over the controversial backstop – having received new written assurances from the EU that it would be temporary and, if triggered, would last for “the shortest possible period”. But some 118 Conservative MPs – from both the Leave and Remain wings of Mrs May’s party – voted with the opposition parties against her deal, while three Labour MPs supported the deal. Former Conservative education secretary Justine Greening told the BBC the prime minister needed to find a compromise quickly. “We need to rapidly – and I’m talking in days, not weeks – find out if Parliament can get behind any other path forward,” she said. Meanwhile, Labour MP Chuka Umunna said that if his leader did not secure a general election, Mr Corbyn should do what the “overwhelming majority” of Labour members want and get behind a further EU referendum. Lib Dem leader Sir Vince Cable, who also wants a second referendum, said Mrs May’s defeat was “the beginning of the end of Brexit”. What does this mean for Northern Ireland and the Irish border? Dublin is playing this carefully, writes BBC political reporter, Johnson Michael. The Irish government is reluctant to say anything that could further stoke tensions, but all the while acutely aware that time is running out. It continues to ramp up no-deal preparations, including on key issues like transport and the supply of medicines. The DUP says the scale of the defeat last night means the backstop cannot remain in the deal, but Irish thinking is unlikely to budge. It is mindful of its often-repeated commitment to avoid the return of a hard Irish border, and has banked on the backstop being its insurance policy to ensure that. It will now be looking to its support network in Brussels to stand firm in the face of any political pressure from Westminster. It doesn’t sound like Theresa May has any enthusiasm for junking her deal. Indeed, a source that was on a conference call with business leaders – hosted by the chancellor and other cabinet ministers – was told they could not renegotiate the Withdrawal Agreement. The plan instead was for a “shake down” of MPs in the next few days to find out what they would tolerate in terms of promises for the longer term future relationship. As we’ve discussed here before, the cabinet doesn’t even have a clear view itself on how she should proceed. [On Tuesday], the leader of the House of Commons told me it would be Brussels that has to move. But some others are crystal clear that the PM will have to soften her offer, because that’s what Parliament will tolerate.